Today, English doesn’t think that Texans face that same disadvantage. In the winter of 2010, English made a short video, how to explain the art world to a dead hare, in which a stuffed rabbit full of paint is run over by a Porsche. That video was shot in Texas with a team of locals, and English hoped that the video would show them that “even if you’re stuck down here, you can do something for no money or next to no money. You can reach out and get your art outside of the valley. You’re not really stuck here. You just have to think, ‘What do we have here that nobody else has?’ and then exploit that and put it out there. You’re not as isolated as you think. You’re only isolated because you think you’re isolated.” The video has over 30,000 views on YouTube. But an artist doesn’t need a name like English’s to make their work spread beyond their hometown. 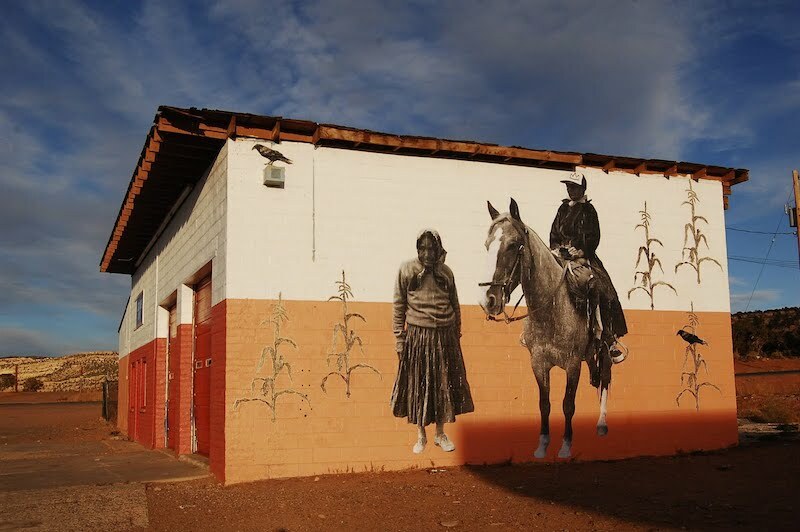 Chip Thomas aka Jetsonorama and Yote, two artists based in Arizona, made it onto Wooster Collective in 2010 thanks to a lucky find by a fan of the blog who sent her photos to the Schillers, and both artists have also made it onto Unurth and Vandalog. As a result, their work in sparsely populated areas has been seen and appreciated by people around the world. In fact, Yote and Thomas met after being connected through Vandalog. Yote had taken photos of some pieces by Thomas and Gaia posted the photos to Vandalog. Thomas saw the post, and reached out to Yote, whose work Thomas had seen only a few days before in the form of a wheatpasted image of a coyote nearby one of his own wheatpastes. Much like Logan Hicks and Jeremiah Garcia, these two artists, who lived relatively close to one another and were working in the same area, were connected by a blog headquartered in another country. Without the internet, perhaps Yote and Thomas never would have met and collaborated. Chip Thomas aka Jetsonorama and Yote’s first collaborative installation (October 2009). Photo by Chip Thomas.